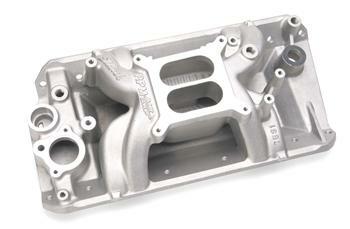 Edelbrock Intake Manifold - Air-Gap Series UNIVERSAL - MiataRoadster - Stay tuned with MiataRoadster! This award-winning design incorporates the same race-winning technology that’s been used on our Victor Series competition intakes for years. The air-gap design features an open air space that separates the runners from the hot engine oil resulting in a cooler, denser charge for more power. RPM Air-Gap manifolds are modeled after Performer RPM intakes for high performance street power from 1500-to-6500 rpm, and the new Performer Air-Gap manifolds are ideal for street performance from idle-to-5500 rpm.